Contents: French fries, a piece of baguette, burger patty, cake, puff pastry with cheese and bacon, and a cup of something to drink. Not sure why the previous comment didn't get posted, resending it just in case. The golden packed thingie at the back is a portion of Camembert cheese and there's also some Yoghurt. Most likely the beverage is just plain tap water. Also there's some bug with the captcha form layout : anything below the captcha image is clipped out, hence the difficulty to post any comment. 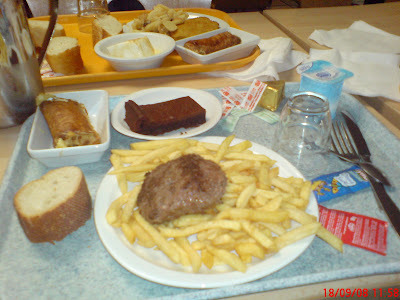 Boy they eat good in france! That's a lot of awesome food!